NASA's Hubble Space Telescope has given us a keyhole view towards the heart of our Milky Way Galaxy, where a dazzling array of stars reside. Most of the view of our galaxy is obscured by dust. 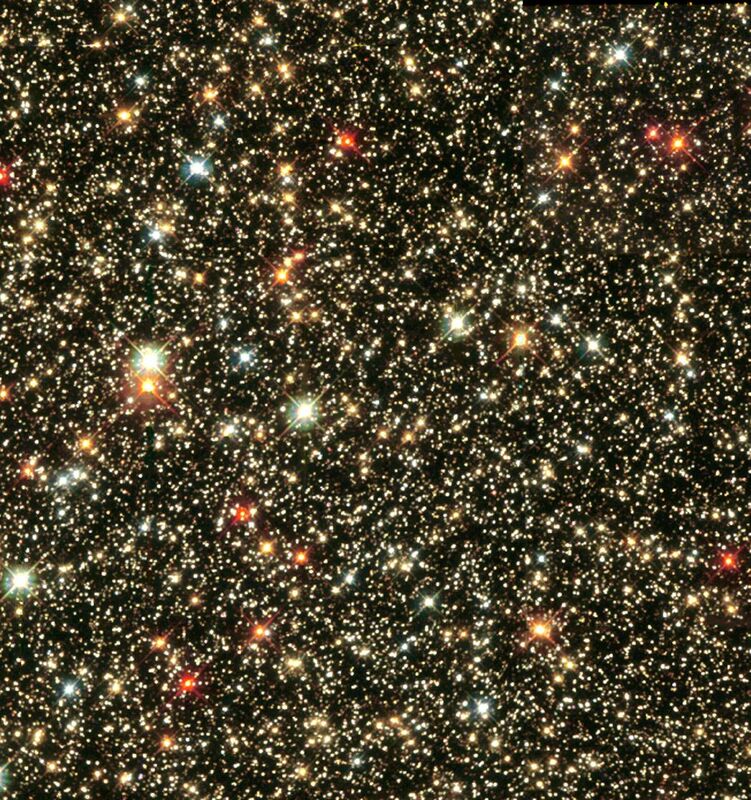 Hubble peered into the Sagittarius Star Cloud, a narrow, dust-free region, providing this spectacular glimpse of a treasure chest full of stars. Some of these gems are among the oldest inhabitants of our galaxy. By studying the older stars that pack our Milky Way's hub, scientists can learn more about the evolution of our galaxy. Many of the brighter stars in this image show vivid colors. A star's color reveals its temperature, one of its most "vital statistics." Knowing a star's temperature and the power of the star's radiation allow scientists to make conclusions about its age and mass. Most blue stars are young and hot, up to ten times hotter than our Sun. They consume their fuel much faster and live shorter lives than our Sun. Red stars come in two flavors: small stars and "red giants". Smaller red stars generally have a temperature about half that of our Sun, consuming their fuel slowly and thus, live the longest. "Red giant" stars are at the end of their lives because they have exhausted their fuel. Although many "red giant" stars may have been ordinary stars like our Sun, as they die they swell up in size, become much cooler, and are much more luminous then they were during the majority of their stellar life.